Ernest Shackleton is one of the giants of Antarctic exploration, many consider him to be the pre-eminent Antarctic explorer. It may come as some surprise therefore to learn that he was not actually part of any major successful discovery or exploration in Antarctica. On the Discovery expedition, he was invalided home early. On the Nimrod expedition, he was one of a party that failed by just 97 miles to be the first men to reach the South Pole and on the most famous expedition on the Endurance, the original goal was never even remotely achieved. However the whole is certainly greater than the sum of the parts and despite a lack of obvious and glorious "firsts" what Shackleton achieved in his trips to Antarctica has never been equaled and stands in the annals of exploration as some of the most incredible and courageous adventures ever recorded. His legacy is of bravery in the face of adversity, of never letting down those who you have personally promised they can depend on you for a mutual goal even when the goal is lost, of personal responsibility, sacrifice and example that continues long after many would have forgiven him for giving up. Yet Shackleton was forgotten for much of the 20th century until around the mid 1980's when once again his achievements were recognised, currently (2015) he is perhaps lionised to a degree beyond what is fair in relation to other explorers of the Heroic Age, especially as there are other Antarctic "heroes" whose actual material achievements were much greater and have been forgotten. Part of the reason is perhaps that he is seen as a guiding light for management consultants and trainers who think that by studying and following his example, they can sell more blue widgets in the suburbs - personally, I feel this perspective is demeaning to Shackleton and to all explorers and adventurers and smacks of a desperate attempt by those involved to imbue their chosen, ultimately trivial, pursuit with a nobility it does not deserve. 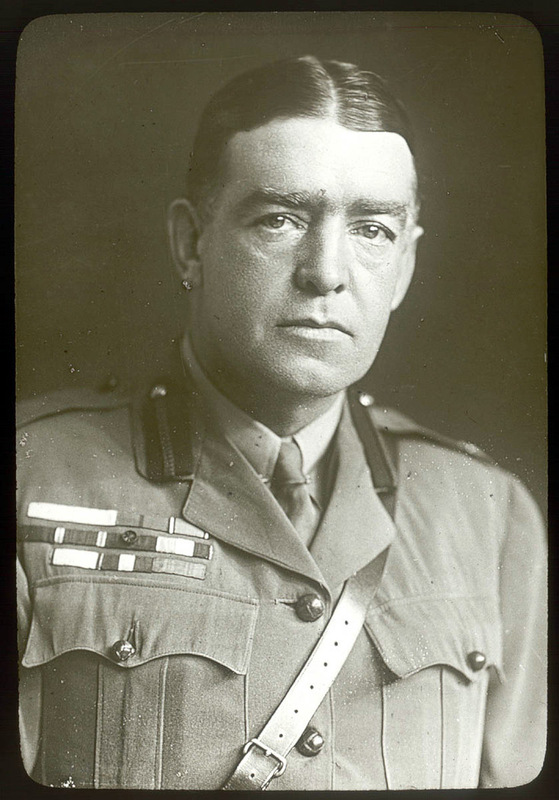 Shackleton is certainly a giant in the Antarctic roll call of heroes, like all real heroes he was flawed in parts of his life, but like all heroes, in that part part of his life that called for heroism, he was not wanting. 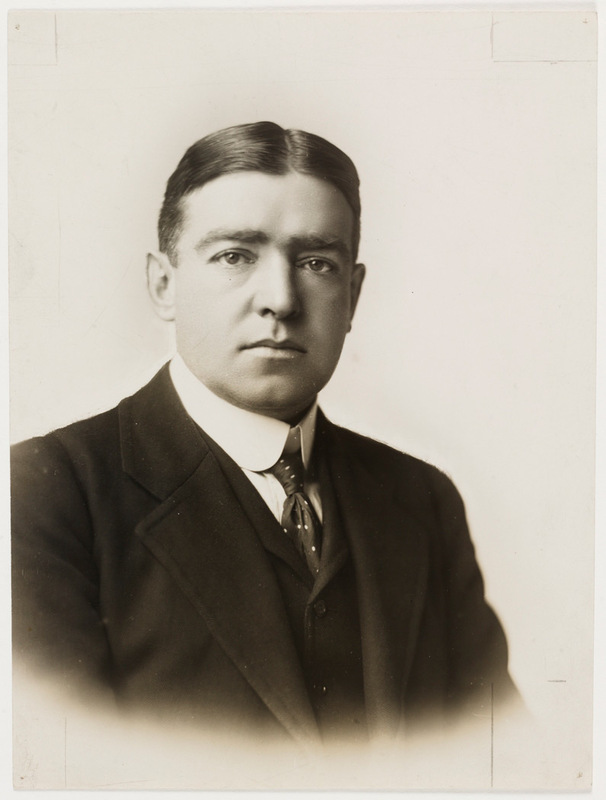 Ernest Henry Shackleton was born on February 15th 1874 in County Kildare Ireland, to where the family who were originally from Yorkshire, had moved. His father hoped for Ernest to enter the field of medicine, though Ernest had other ideas, at the age of 16 he joined his first ship sailing out of Liverpool in the merchant service. He took naturally to a life at sea and progressed through the ranks, by the time he was 24 he was qualified to command a British ship anywhere she may be. 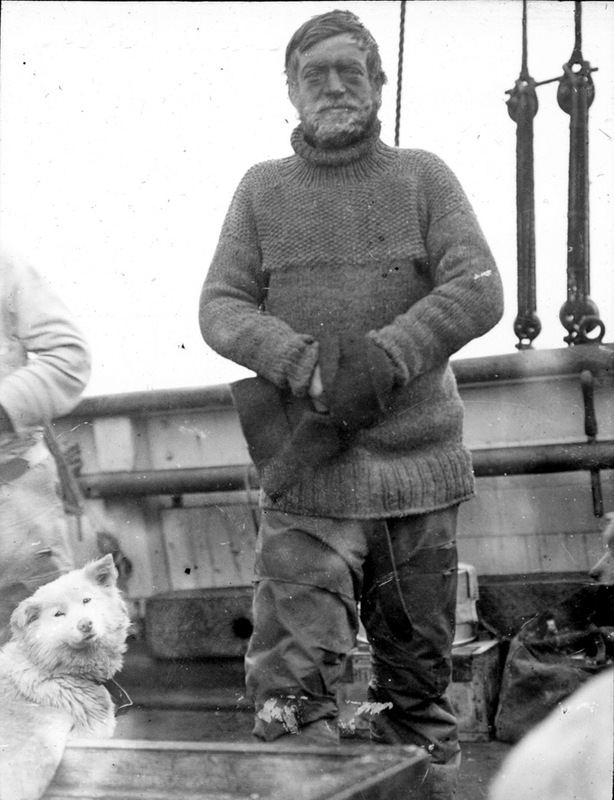 Frank Hurley, left and Ernest Shackleton, right. 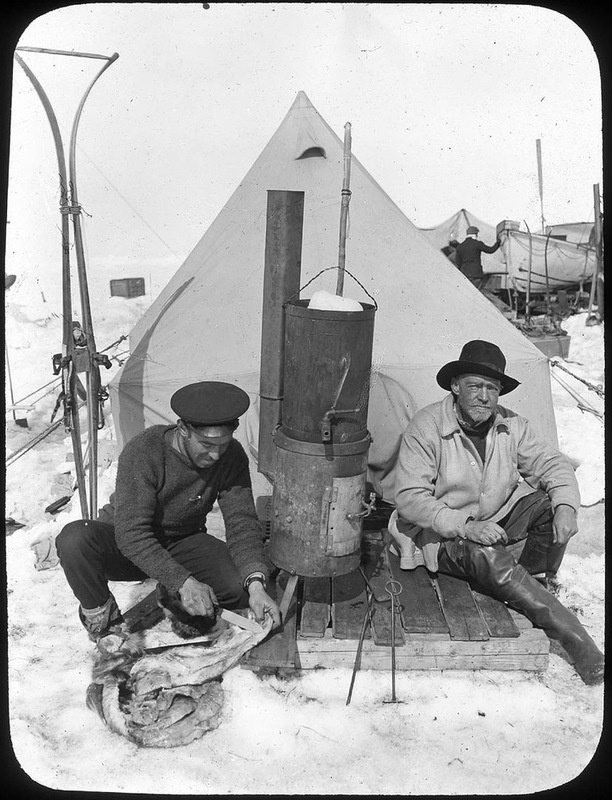 Camp on the floe after the Endurance had been sunk and before the journey to Elephant Island. Hurley is preparing a penguin skin to provide fuel for the stove. 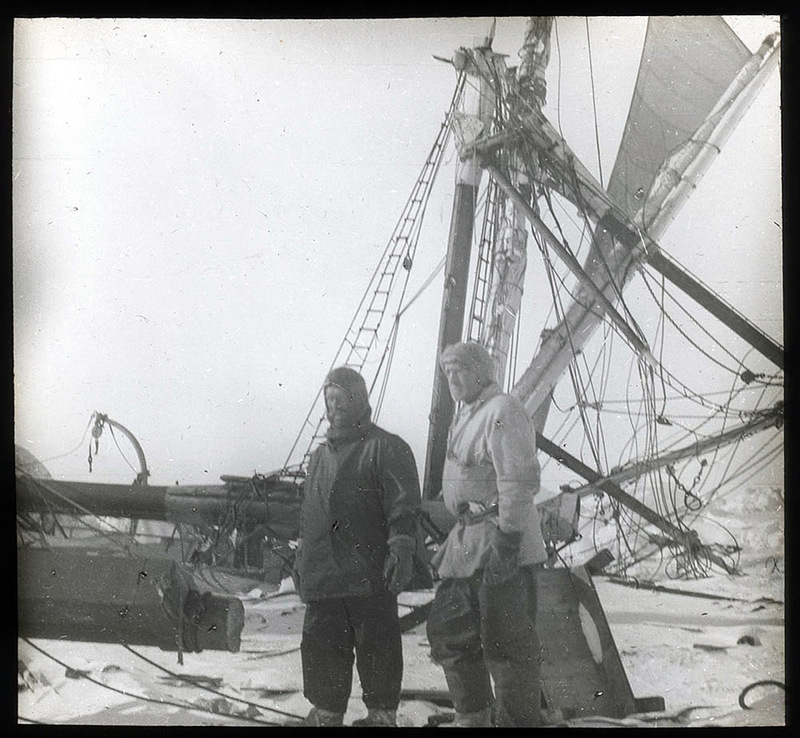 Frank Wild, left and Ernest Shackleton, right, with the wreck of the Endurance after it had been crushed by ice and before it had sunk beneath the sea. 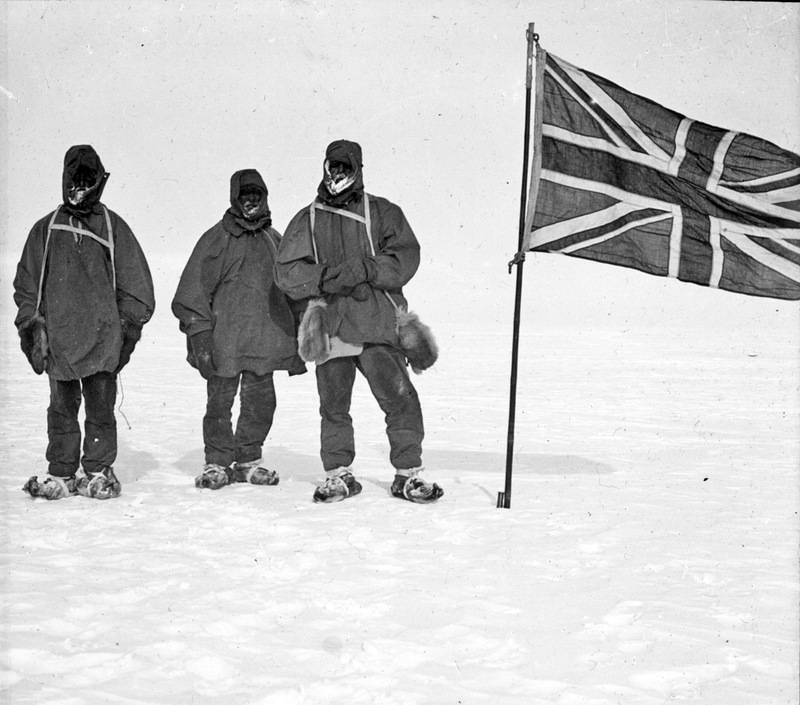 Left to right: Jameson Adams, Frank Wild and Eric Marshall, photograph by Shackleton. Farthest Southat the time, January 1909 on the Nimrod expedition, 97 miles from the South Pole. In 1901 he joined the British National Antarctic Expedition on board the Discovery under Captain Scott, he was invalided back to New Zealand a year before the end of the expedition. He busied himself however in fitting out the Discovery relief expeditions under the Admiralty Committee, and also helped in fitting out the Argentine expedition on the ARA Uruguay that went to the relief of the Swedish Antarctic Expedition. He married Emily Mary Dorman in 1904 on his return from the Antarctic and the Discovery Expedition and so followed a time pursuing a career back home as befitted a gentleman. He became secretary and treasurer of the Royal Scottish Geographical Society, a post he resigned to contest the Dundee seat at the 1906 election as a Unionist candidate. In this he was unsuccessful and found a position as personal assistant to William Beardmore head of a Glasgow firm of battleship builders and armour plate manufacturers. 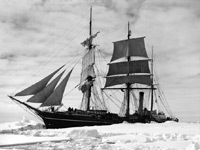 Such normality did not suit Shackleton and he took an expedition to Antarctica in 1907 on the Nimrod. On this expedition, Shackleton established a "furthest south" record for the time just 97 miles from the South Pole while another party form the expedition were the first to reach the magnetic South Pole - they also took the very first motor car to Antarctica. After Amundsen and Scott had reached the South Pole in 1912, Shackleton thought that the next great conquest was to traverse the Antarctic continent from coast to coast via the pole and with this end, so set forth the Endurance expedition of 1914-17. Although this expedition was possibly the least successful Antarctic Expedition at the time in terms of achieving the goal - through no fault of planning or foresight - it became one of the greatest adventure stories of all time and enshrined Shackleton's reputation in legend. Return to England was once again an anti-climax and Shackleton spent a long time on a lecture tour circuit. He put together another expedition to Antarctica aboard the Quest in 1921 in an attempt to map 2000 miles (3200 km) of coastline and conduct meteorological and geological research.. By this time he was in poor health though was disguising it well from those around him, blaming muscular pains or the like. He died of a suspected heart attack on board the Quest as she was at anchor in King Edward Cove, South Georgia at the age of 47 in 1922. Shackleton was buried on South Georgia and his death brought to a close the "Heroic Age" of Antarctic exploration. The grave was marked by a headstone of Scottish granite in 1928. There radiated from him something strong and powerful and purposeful so that even to meet him was an experience. It was something that I have never come across in anyone else. He valued loyalty above everything, no one ever questioned his authority." We seem to be a wonderfully happy family, but I think Sir Ernest is the real secret of our unanimity. Considering our divergent aims and difference of station it is surprising how few differences of opinion occur. For scientific leadership, give me Scott; for swift and efficient travel, Amundsen; but when you are in a hopeless situation, when there seems to be no way out, get on your knees and pray for Shackleton. Incomparable in adversity, he was the miracle worker who would save your life against all the odds and long after your number was up. The greatest leader that ever came on God's earth, bar none. Right here is where I wish to tell about the only unfair deal that happened on the expedition. There were not enough fur bags for all hands, so some of the wool bags were used to make up the deficiency. We drew lots to see which kind of a bag each would get. There was some crooked work in the drawing as Sir Ernest, Mr. Wild ( second in command ), Captain Worsley, and some of the other officers all drew wool bags. The fine warm fur bags all went to the men under them. I think that action was enough to show what wonderful men were in charge. They always took the brunt of things and when there was any danger they were first to go ahead. The safety of his men was Sir Ernest's first thought, his own last. Asked by an interviewer asked 60 years after rescue: "How were you able to survive, as so many other people perished with expeditions?" And what a grand tentmate Sir Ernest was. . . He was the very soul of encouragement . . . In spite of his heavy burdens, Sir Ernest retained all that wholesome boyishness of spirit that had endeared him to all. . . Sir Ernest's memory was inexhaustible. He had a ready phrase or a quotation for everything. A born poet, through all his oppressions he could see glory and beauty in the stern forces which had reduced us to destitution, and against which he was fighting. Shackleton privately forced upon me his one breakfast biscuit, and would have given me another tonight had I allowed him. I do not suppose that anyone else in the world can thoroughly realize how much generosity and sympathy was shown by this: I DO, and by GOD I shall never forget it. Thousands of pounds would not have bought that one biscuit. Description: That portion of the coast along the W side of the Ross Ice Shelf between Cape Selborne and Airdrop Peak at the E side of Beardmore Glacier. 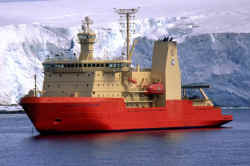 Named by NZ-APC in 1961 after Sir Ernest Shackleton. Shackleton discovered the area beyond Shackleton Inlet to the Beardmore Glacier, and was the first to find a practicable route to the South Pole. Description: An undersea fracture zone name found on the Pacific-Antarctic sheet of the Circum-Pacific Project charts. Name approved 6/87 (ACUF 225). Description: An ice-covered pass rising to c. 300 m between King Haakon Bay and Possession Bay, South Georgia. The name Shackletons Pass, after Sir Ernest Shackleton, was used on a map in his book the route across South Georgia used by the Shackleton party in 1916. The form approved was recommended by the UK-APC in 1957. Description: A major glacier, over 60 mi long and from 5 to 10 mi wide, descending from the polar plateau from the vicinity of Roberts Massif and flowing N through the Queen Maud Mountains to enter the Ross Ice Shelf between Mount Speed and Waldron Spurs. Discovered by the USAS (1939-41) and named by US-SCAN for Sir Ernest H. Shackleton. Description: An extensive ice shelf fronting the coast of Antarctica for about 240 mi (95E to l05E), projecting seaward about 90 mi in the W portion and 40 mi in the east. The existence of this ice shelf was first made known by the USEE under Wilkes who mapped a portion of it from the Vincennes in February 1840. It was explored by the AAE under Mawson (1911-14) who named it for Sir Ernest Shackleton. The extent of the ice shelf was mapped in greater detail in 1955, using aerial photography obtained by USN OpHjp, 1946-47. Further mapping by the Soviet Expedition of 1956 showed the portion eastward of Scott Glacier to be a part of this ice shelf. Description: Extensive icefalls of the upper Beardmore Glacier, southward of Mount Darwin and Mount Mills. Named by the British Antarctic Expedition (1910-13) for Sir Ernest Shackleton who first penetrated this region as leader of the BrAE (1907-09). Description: A reentrant, about 10 mi wide, between Cape Wilson and Cape Lyttelton. It is occupied by the terminus of Nimrod Glacier descending at a low gradient from the bordering highlands to the Ross Ice Shelf Discovered by Capt. Robert F. Scott, RN, in December 1902, while on his attempted trip to the South Pole. He was accompanied on this trip by Dr. Edward A. Wilson and Lt. (later Sir) Ernest H. Shackleton, RNR, for whom this inlet was named. Description: Range of mountains rising to 1,875 m, extending in an E-W direction for c. 100 mi between Slessor and Recovery Glaciers. Seen from the air by the CTAE, 1956, which surveyed the W part of the range from the ground in 1957. The range was photographed from the air by the U.S. Navy in 1967 and further surveyed from the ground by BAS from Halley station, with support from USN C-130 Hercules aircraft, 1968-69 and 1969-70. Description: A broad valley running WNW from Stromness Harbor, Stromness Bay, in South Georgia. Named by the UK-APC after Ernest Shackleton, whose epic traverse of South Georgia with two of his men, in May 1916, following their boat journey from Elephant Island, ended in this valley. Description: Mountain, 1,465 m, with perpendicular cliffs facing W, standing 2.5 mi E of Chaigneau Peak between Leay and Wiggins Glaciers, on the W side of Graham Land. Discovered by the FrAE, 1908-10, under Charcot. Description: A crater at the south pole of the moon, 21km in diameter and 4.2km deep. The peaks surrounding the crater are in almost continual sunlight while the interior is in perpetual shadow and is thought to be a repository for frozen water from impacts on the lunar surface.